Afrikaans, one of the official languages of South Africa, spoken by some seven million speakers and widely recognised by the leadership of the African National Congress for its contribution to dissident literature has produced a number of writers of global significance. It remains a vibrant literary culture as the writing of J.M Coetzee, Marlene van Niekerk, and others testify. The love letters of novelist, André Brink and poet, Ingrid Jonker, written between April 1963 and April 1965, return to the reader to a time of protest against censorship when no criticism of South Africa’s race policy was tolerated, and is perhaps a timely reminder for South Africans. This entry was posted in Uncategorized on January 27, 2016 by Karina. A God in Ruins is many things. It is the story of a British family set against the historical background of the past century. It is a novel about war and its aftershocks. It is a fine enquiry into human nature. But above all, it is a declaration of love for literature, its power and its manifold mysteries. And it is highly ambitious. What astounds about A God in Ruins is that it never falls short of these formidable ambitions. Such novels are rare. They take root in your mind and blossom in your soul. Even ferocious readers encounter a novel like this only once in a while. The way it captures fiction’s ability to heal, to open up spaces in us we never even knew existed is striking. It is poetic in style as well as in its wisdom. For me personally, A God in Ruins was a magical key. It opened two doors in my life. Two doors connecting the past to my fragile present: one appeared while I was still reading, the other after I’d finished the novel. I stepped through the first, an imaginary one, during one of those serene nights when you are at peace with the world and yourself. It was around midnight. I was lost in the arms of a comfy easy chair; a soft caramel light illuminated the room. When I looked up from the book, I saw something so beautiful that I wanted to hold on to it forever. But I was scared to disturb the scene by searching for my camera, so I turned to the last blank page of A God in Ruins and drew a sketch of what was in front of me: a moment of flickering hope. It is also engraved in my heart. This entry was posted in Memories, What I've Read, What I've Written and tagged A God in Ruins, André Brink, Behind the Scenes at the Museum, Costa Novel Award, death, Doubleday, family, Gold Dust, grief, Karina Magdalena Szczurek, Kate Atkinson, library, Life After Life, literature, LitNet, Nadine Gordimer, review, war literature on January 19, 2016 by Karina. Last year, I realised that I have a penchant for penguins with foreign names. Midyear, I was enchanted by Misha, the penguin who stars in Andrey Kurkov’s wonderful novel, Death and the Penguin (originally published in Russian in 2002). Towards the end of 2015, I fell in love with Juan Salvado, the protagonist of Tom Michell’s memoir, The Penguin Lessons. When he was in his twenties, Tom Michell travelled to Argentina to teach at a boarding school during the politically volatile 1970s. In his free time, he explored South America. On one of his trips, he arrived at a Uruguayan beach to discover a massacre: corpses of oil-coated penguins scattered all around on the sand. There was one survivor among them, a Magellan penguin barely moving, covered in oil and tar like all the other birds, but clearly still alive. “I needed a penguin like a penguin needs a motorbike,” Michell writes, but on the spur of the moment, he resolved to rescue the penguin and took him back to the flat he was staying in. The ensuing story of their initial encounter and the fascinating relationship which developed between the young man and the sea bird is one of most moving books I have read last year. After a nearly disastrous but hilarious attempt at cleaning the penguin in the pristine bathroom of his hosts’ home, Michell tries to set the bird free, but his new acquaintance is extremely reluctant to be abandoned again. Not knowing what else to do, he names the penguin and devises a plan to smuggle him into Argentina. And so their adventures and a remarkable friendship begin. Back at the boarding school, Juan Salvado forms the most extraordinary relationships with the students and staff alike, irrevocably changing all their lives. Michell’s commentary on the socio-political situation of Argentina of the time is subtle but highly intriguing. His descriptions of penguin and human natures and how the two can relate to one another are simply beautiful. Magallan penguins do not live forever and since all of this had happened four decades ago, I assumed that there would be heartbreak at some stage in the book. I was reading the dreaded scene in a coffee shop where another customer became quite concerned about me when she saw my copious tears falling. I was too choked up to articulate my sorrow, but she understood when I pointed at the open book in front of me. I cried again before the last page, but not because of sadness. There are two revelations towards the end of the book which touched me deeply: one concerns the reason why Juan Salvado refused to go back to the sea when Michell first met him, the other is a description of a recent find among Michell’s memorabilia. If there ever was a feel-good book, The Penguin Lessons is it. It goes to show that, occasionally, we all need a penguin in our lives. First published in the Cape Times, 15 January 2016. This entry was posted in What I've Read, What I've Written and tagged Andrey Kurkov, Argentina, Cape Times, Death and the Penguin, Karina M. Szczurek, Karina Szczurek, Penguin Books, penguins, review, The Penguin Lessons, Tom Michell, true story on January 18, 2016 by Karina. It’s not often that you get to star in a Fairytale where you are The Princess and a real Hero comes to save you, but that’s the story of my Christmas Miracle. To say that last year was rough for me would be a bit of an understatement. Yet being a glass-half-full kind of person, I will not deny that magic and beauty did not abandon me when all else seemed lost. Both continued flowing not only from the hearts of the amazing people who love me but also from complete strangers. One of the most magical moments of last year was encountering Jack Reacher, my Hero. Falling in love – fictional or otherwise – is a beautiful gift. When that love allows you to reclaim something as precious as reading is to me, then you let your long braid hang out the window and hope that your Knight In Mattress-Pressed Armour holds on tight. Nearly twenty books later – i.e. approximately 2 000 000 words – he still does! (In my book, that’s a miracle in itself.) 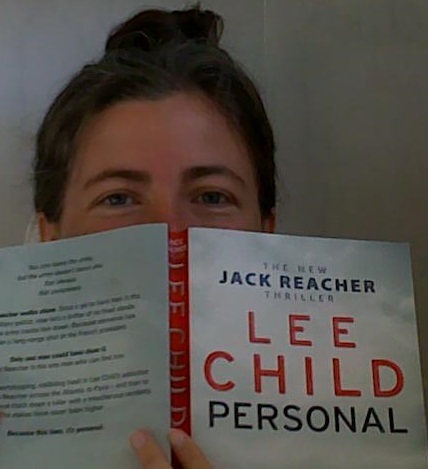 I am almost finished with Personal – the last of the existing Jack Reachers for me – trying to make it last by reading only for comfort when Dragon Insomnia rears her ugly head, but soon that adventure will also come to an end and I will have to join the rest of the Reacher Creatures who are counting the days until September when Night School, Reacher No. 21, is published. As a reader, I ask myself what are all the other months in the year for? But I suppose Lee Child should be allowed to sleep at some stage. And I need to get my act together and follow Jack’s example by simply sleeping when I want to. Perhaps I must see whether headbutting works on dragons…? 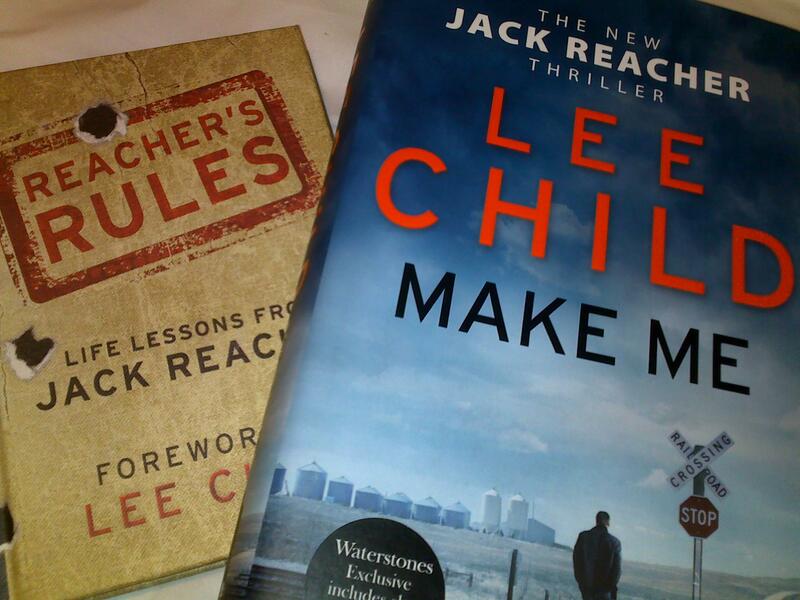 Having become one of Jack’s greatest fans, you can imagine my excitement when I found out about the publication of Andy Martin’s Reacher Said Nothing: Lee Child and the Making of Make Me. It appeared towards the end of last year and before it became available in South Africa (still waiting for it to arrive on our shores, so that I can share it with friends who love Jack as much as I do), I tweeted about it, saying something like, “What could possibly make me happy for Christmas?”, and adding, “Karina said nothing.” At that stage, I hadn’t clicked that Andy Martin and I were actually following each other on Twitter. My friend Helen Moffett, whom I’d infected with Reacher Fever, saw my tweet, and kindly offered to get me a copy of Reacher Said Nothing as at the time she was staying in the U.S. where the book was already in the bookshops. Lo and behold, Andy Martin saw our Twitter exchange and generously offered not only to send Helen a book for me, but to sign it, get Lee Child to sign it, and to add a second signed copy for her into the parcel. There are moments in life when it is easy to believe in fairytale miracles. And this was only the beginning! Helen received the promised gifts, but resisted the temptation to read the book until her return to South Africa in mid-December when she delivered my copy to me and we began our Christmas tandem reading of Reacher Said Nothing. And what a joy it has been! The book is everything that a Reacher fan might have wished for, and more. Reacher Said Nothing is dedicated to “all those loyal readers of Lee Child who may have bought this book by mistake” and opens with two epigraphs: a quote from James Boswell’s The Life of Samuel Johnson, and one from one of my absolute favourites, Alberto Manguel’s A History of Reading in which the author writes about the different ways of reading – for the action and characters of the story, and for the detailed exploration of the texture of the narrative. Andy Martin’s ensuing analysis of Lee Child’s creative process is both. Martin approached Child with the idea for the project in 2014, only days before 1 September when Child traditionally begins writing his next Reacher novel. It was to be the twentieth in the series, Make Me. In an email of 22 August, Martin proposed “a kind of literary criticism but in the moment, in real time, rather than picking it up afterwards…trying to capture the very moment of creation…you would have someone (i.e. me) looking over your shoulder as you are typing the words.” Five days before the first word of Make Me appeared on Child’s computer screen, he said yes. And off they went. Writing a book as great as Reacher wasn’t easy. Reacher Said Nothing takes us not only behind the scenes of Make Me’s genesis, but also to the day in 1994 when Child bought the paper and pencil with which he wrote Killing Floor, the first in the Reacher series, and explores much of the before and in-between from uncertain beginnings to stratospheric success. More importantly, it throws light on the magic that happens whenever any writer picks up a pen and begins dreaming. In this respect it is as much a book for readers as for writers. When writing, Child thinks like a reader; that’s his thing. But there is no magic formula. Only a lot of doubt, hard work, and hope. Trust. And when you are lucky, a good story to tell. “He would have been good around the campfire, Lee – he would definitely make you forget about the wolves or the saber-tooth”, Martin writes. From the start when I began reading Killing Floor, I recognised and was captivated by a quality in the novels that intrigued me: an attention to word choice, syntax, punctuation – a kind of poetry that I now realise is fully conscious, intentional. 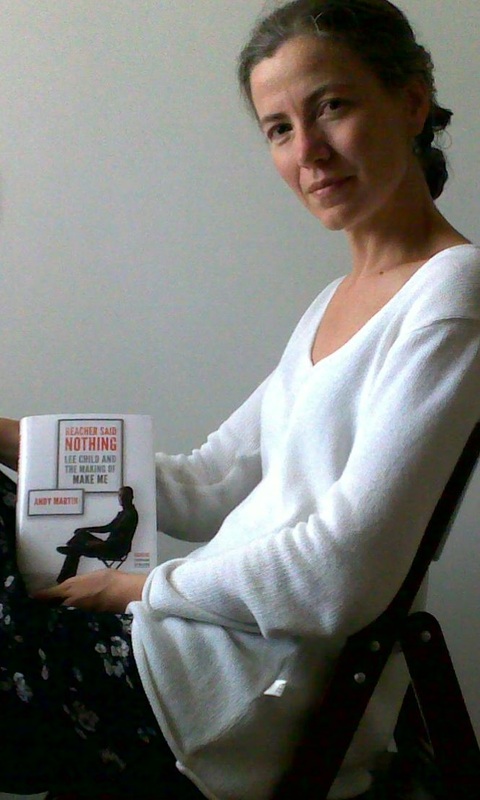 “It all mattered, linguistically”, Martin writes. It’s about noticing things. And to see the process unfold is fascinating. Child writes only one draft, but the meticulousness with which he constructs the narrative allows him to. There are numerous smileys in the margins of my copy of the book. I have scribbled, underlined, single and double, all over. Martin and his subject emerge from Reacher Said Nothing as two people who are really passionate about what they are doing, are prepared to work their fingers to the bone in pursuit of their visions, and know how to have fun while doing it: “I live in a permanent daydream. I get paid to daydream narratives”, Child says. It pleased me no end to discover that they both eat cheese and marmalade sandwiches. And to read about “the grape in the fridge”. Lee Child’s relationship to his fictional hero is highly interesting. Anyone who has non-existent people – I am hesitant to write – living in their heads, knows what it’s like. Creation is a thrill. All of us, readers and writers alike, are junkies. Completely unrelated to me, the name ‘Karina’ is mentioned in Reacher Said Nothing. It made me smile. 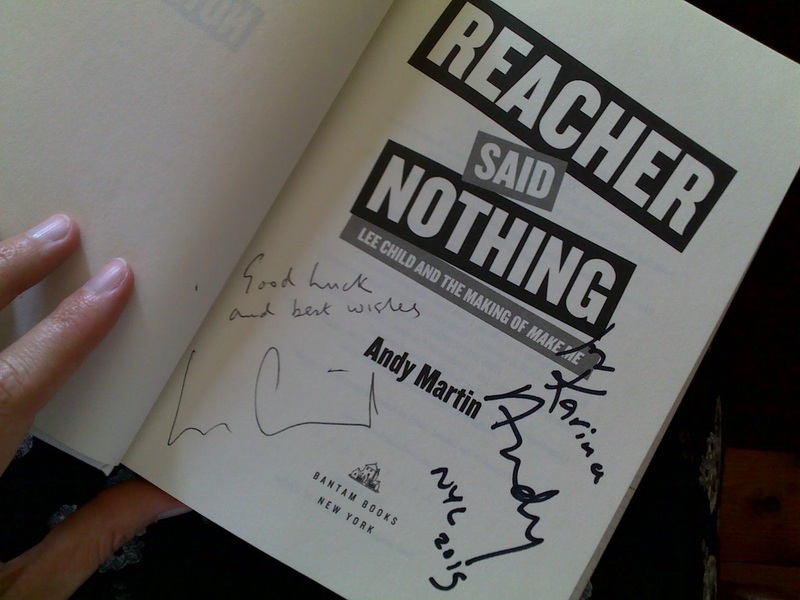 A Karina is rumoured to appear in Andy Martin’s next book, Reacher Said Something, but that’s another story about writing about writing about writing… Another daydream. In Make Me, Reacher is concussed. “He’s rambling on about books. A bit like you,” Child says to Martin when writing the scene. And I am about to headbutt a dragon, and live happily ever after. This entry was posted in What I've Read, What I've Written and tagged A History of Reading, Alberto Manguel, Andy Martin, Christmas, dragon, fairytale, Helen Moffett, hero, Jack Reacher, James Boswell, Killing Floor, Lee Child, Make Me, Night School, Personal, princess, Reacher Creatures, Reacher Said Nothing, Reacher Said Something, signed copy, The Life of Samuel Johnson, twitter on January 4, 2016 by Karina.